in my own personal reference library. Mount Airy NC 27030 In full color. Gives a lot of valuable information regarding all Pepsi bottles, with full color pictures and pricing of each one. A lucky find for a source book. 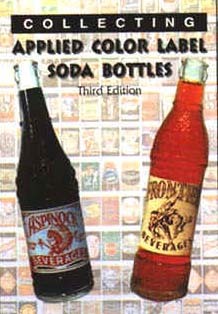 "Pepsi:Cola Bottles & More Collector's Guide Vol 2"
contain bottles shown in Vol 1. ISBN: 0-964-5443-1-8 All new! Vol 2 contains over 1525 bottles in 169 pages. All color enlargements with over 800 items pictured. Included is a combination of over 610 Pepsi embossed, paper label, ACL, etc., plus other Pepsi products. Also featured is over 860 Mountain Dew bottles, plus 55 Mountain Dew competition bottles and cans. "Pepsi Memorabilia... Then and Now"
Pepsi-Cola marked its 100th anniversary in 1998 with much fanfare for the internationally known beverage! This book compiles a fabulous array of Pepsi-related collectibles, shown with a price guide. Items pictured include advertisements, bottles, jewelry, knives, signs, tableware, toys, umbrellas, and watches. Also are items limited in production, test items, early products, and products internationally owned and distributed by Pepsico, Inc. such as Aspen, Jake’s Diet Cola, Devil Shake, Tropic Surf, Skandi, Patio, Kas, Mirinda, Pepsi’s H2OH! line, Teem, Josta, and, of course, Pepsi-Cola, Mountain Dew, Slice, Mug root beer, and much more. 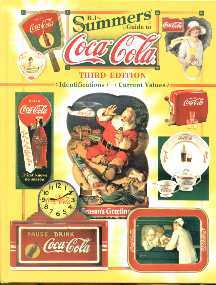 "B J Summers' Guide to Coca-Cola"
"B J Summers' Guide to Advertising Memorabilia"
"Collecting Applied Color Label Soda Bottles"
This book can be obtained from the Painted Soda Bottle Collectors Association. plus a color picture of the labels for each one. This Third Edition includes a chapter on Bottling Company History by "me". and this book - CLICK HERE. anything with a soda brand logo on it. Useful in dating articles and includes pictures and prices. Includes many rare brands to find. 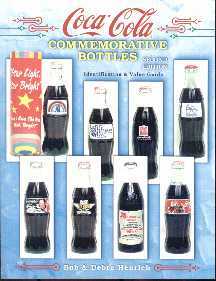 Most of the modern hobbleskirt commemorative Coca-Cola bottles have been produced since 1991, and the miniatures only since 1993. Because they are so recent and so widely available, many people are beginning to collect them. This is the first price guide ever written on the subject that includes color photographs. More than 1,100 color photographs have been used within eleven chapters, and a brief history of the bottles in the beginning will lead you through page after page of Coca-Cola bottle collecting delight. Every bottle from the 3-inch high miniature bottles to the tall 10-ounce bottles have been covered, following their production year by year. All of the details are here, including price ranges. and some of the bottles are pictured. This book is filled cover-to-cover with approximately 2,000 bright, color pictures of the most sought-after Coca-Cola products ever made, from advertisements, trays, and bottles to haberdashery, jewelry, and amazing one-of-a-kind novelties, all with prices reflecting today's market. From its earliest offerings to a modern-day selection, Coca-Cola is well represented by this definitive text, which includes many of the rarest pieces from within the Coca-Cola Company's own archives. 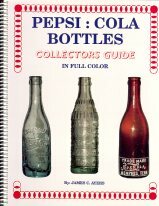 This book is the first full color Pepsi-Cola collectible guide ever written. It contains over 1500 color photographs of Pepsi collectibles ranging from the rare to the interesting. "The Encyclopedia of Pepsi-Cola Collectibles"
Divided into four sections — signs, containers, novelties and toys, and paper collectibles — collectors will find everything from early Pepsi trays to cardboard signs, and matchbooks to toys. Features 2,000 individual items with current values, accurate descriptions, rarity ratings, and full-color photographs. Presents a fascinating historical perspective of the Pepsi-Cola Company, including the evolution of their famous logo. From Miracle Medicine to Pop Culture"
"A delightful coffee-table book and a fine source of information on a pervasive cultural phenomenon." ". . . a greatly entertaining book for collectors of Americana, nostalgia lovers, and enthusiast of popular cultural memorabilia." are available at Amazon.com - so check out what is there!